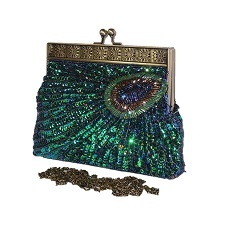 Classic Peacock Sequin Beaded Handmade Clutch Handbag bag!! A perfect fashion statement for any occasion. Made in China by Hand sewn with amazing. Hand made with shiny beads and sequins. The embroidery pattern is like peacock feather. One inner pocket.Chrome kiss lock closure.Both Sides are same. Beaded and sequin exterior gives a multifaceted shine and glimmer. Petite but roomy enough to store all your necessities.